Today we've got another chance for you to peep on a maker's studio space! This one has some pretty dreamy windows and is surrounded by what looks like a forest to this city-dweller. It's the business home for creative power couple Chris Raia and Andrea Zatarain of Chris & Andy Design. Check out how they make it work for their multiple and varied business needs, plus learn more about how they built their business! A: Chris and I met over 20 years ago while we were students at Rhode Island School of Design. Not long after graduating from RISD, we moved to Boston, MA and started our own businesses. Chris launched an industrial and graphic design firm with the goal of focusing on projects that required seamless integration of two- and three-dimensional design. I focused on custom jewelry design and designed housewares with Chris. Back then we were sharing a studio space, working together on projects, sharing a car and a small condo just outside of Boston. Chris taught at Wentworth Institute of Technology and I taught in the Jewelry department at RISD. Teaching gave us breathing room and time to grow as designers. Eventually we bought a house, bought a second car, had kids and split up the studios for a while. The offset roof line acknowledges the surrounding landscape and allows for more windows on the second floor. The exterior stairs save precious indoor space. Recently, we realized that we had a great network and the experience to help other creative entrepreneurs with everything they need to build a successful business. The “Aha!” moment was when I realized that I loved website design, coding, helping clients clarify their business needs and coordinating complex projects. By joining our skills we are able to take care of all the branding and outreach needs a small creative business has. Our philosophy is simple. We want to give creatives more studio time with fewer headaches while they grow their business. We help solve business challenges through strategy, branding and design. We coordinate vendors and services to create a cohesive brand the will be memorable and attract their ideal clients. We look at the whole business picture so we can maximize our client’s return on investment. When Chris needs to cut a long piece of wood on the table saw, we move the table saw over and open the doors. You can see our new-­‐to-­‐us green metal lathe against the back wall. Andy’s studio is off to the right. A: We have been dreaming of our ideal studio space ever since we shared our first 200 square foot studio. In 2013, we decided to move to Wilmington, DE to be closer to family. We found a home that had the perfect spot to build a studio. It took us two years of designing, planning, getting permits and coordinating contractors to built our dream space. This is the second studio we’ve built but it’s the first one that meets all our needs. We planned the space as a two level stand alone building. The lower level is Chris’ wood and metal shop and my jewelry studio. The upper level is the dust free zone where we have an office with two desks and a meeting area. Andy’s jewelry bench with custom built drawers and a pull out soldering area. We added garage floor tiles to protect pieces from getting damaged if they are accidentaly dropped on the concrete floor. Q: What is your favorite thing about your workspace? Your least favorite? A: We both love being able to walk out of the house and go to work - even if it’s a one minute commute. We can keep an eye on the kids without being interrupted if we have a business call. Chris designed the second floor so when you sit down, you feel like you are in a tree house. We are surrounded by trees and get plenty of light. Our least favorite part? We considered plumbing the studio but the cost was too high. It would be nice to have a half bath but then again, we might never leave studio. Upstairs feels like a tree house. We can hear the kids play outside but they can’t see us. We set up a meeting table by the windows. Q: What makes you feel the most productive in your workspace? A: Being able to break from our living area is great. Having a dedicated workspace separate from our home helps us shift into work mode. It’s a quiet space and we have the space to spread out when there is a big project. The windows are strategically placed to minimize outside distractions. Best of all the dishes and the laundry are no longer a distraction. 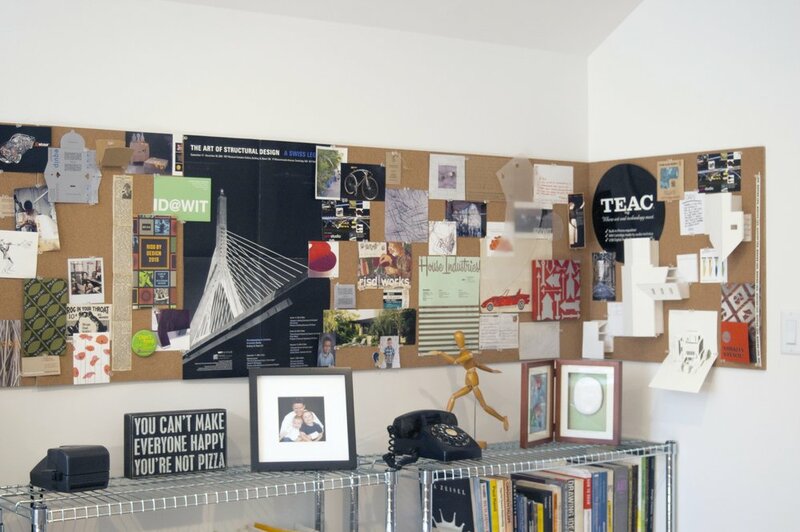 This is our inspiration wall where we keep a few of our favorite things. A: You can find our agency at chrisandandydesign.com or see Andy’s jewelry work at andreazatarain.com and Chris’ portfolio at christopherraia.net.